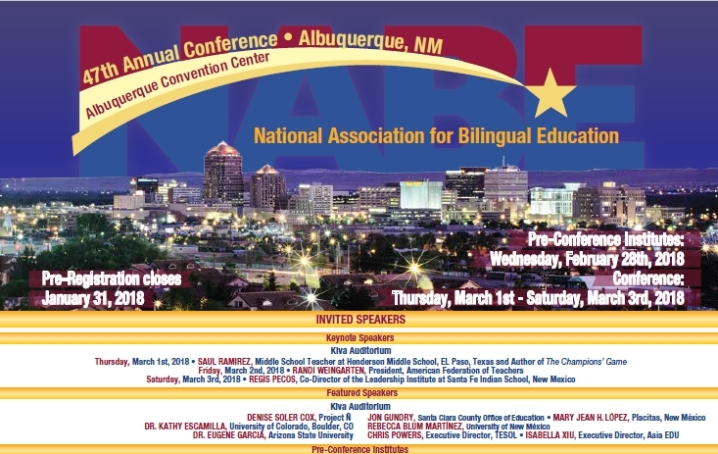 NABE 2018 Registration is open and will close on Jan. 31. Click here to register! Sponsor and Exhibitor Registration for NABE 2018 is open! Sound-Spelling Transfer Kits provide engaging resources and detailed mini-lessons, helping you increase K-2 students’ knowledge of their native language and then transfer what they know to the new language they are learning. Complete Spanish and English materials for bilingual and dual language classes. FREE Sampler. On behalf of the membership of the National Association for Bilingual Education, Joint National Committee for Languages and the National Council for Languages and International Studies, Ana G. Mendez University Systems of Puerto Rico and USA Branch Campuses, Hispanic Education Coalition of DC, American Federation of Teachers jointly with the Associación de Maestros de Puerto Rico, and TESOL International Association, we write to support the requests of the South and Central Florida School Districts most impacted with students from Puerto Rico and the U.S. Virgin Islands who were forced to leave their homeland due to the ravages and destruction caused by Hurricane Maria. Work collaboratively to elevate the national profile of the language enterprise. Early bird registration is available through Nov. 10. Don't miss out on the discounted rate! In recognizing that English language learners are growing 7x faster than the general student population, we created an app to develop school readiness skills in ELLs and bilingual preschoolers. "Care Bears & Amigos in NYC" is available to download on Google Play and on the App Store. "Care Bears & Amigos in NYC" exposes kids to 1500+ words in English and Spanish. It includes early STEM topics, reading skills, numeracy, geometry, problem solving skills as well as social/emotional learning. The app features 30 games, animated Care Bear videos, rhyming songs, and an e-book. Users can toggle between English and Spanish games. The app features characters that are multicultural and relatable to young learners. We have created a world filled with vibrant colors, imaginative scenes and interactive activities. In our connected world, what if empathy is learning?